Preach1 Day – Dynamic expressions to glorify God, His way. Dynamic expressions to glorify God, His way. How the living gets a room(s) in a Mansion of God’s House. For physical training is of some value, but godliness has value for all things, holding promise for both the present life and the life to come. 1Tim 4:8 The Rebirth. We are the ministry that’s called from Heaven to show man how to exit false teaching that there are housing for use in a transit Heaven for the dead in Christ. Man is forever in spirit and after death our spirit waits to be judged, and judged to the next wound portal of blood, and water of a spirit mother! We are sent back into Earth, serving in countless mists of time periods through a female women child who was returned to Earth years earlier, before your coming into Earth. It’s by this wide margins of woman classifications of heavenly mothers or hellish mothers, these are the mothers who makes purpose for a rebirth. 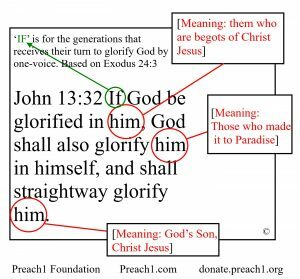 Understanding the mystery of John 14: 2 it is edified and given to the Preach1 Foundation as a phantom to prophecy for such a time in 21St Century. Mansions in my Father’s House, this is an outward expression for all spirits of God that collects into man, as mention in John 14:17, which gives us the grace to understand where the Lord is and how he may use our spirits to commune in us. The Preach1 Foundation offers such a way to have a solid unveiled resource with your name plus your selected Bible verse. Having the above assembled together, is your openly hanging document for a room (not to place inside of a book). We are to keep in mind that God’s House in furnished from Earth to Heaven. The below document would be your first viewable Mansion in Earth with hopes of adding other rooms. 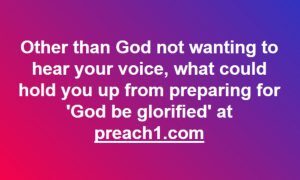 However, there is a requirement; you must be a registered partner with the Preach1 Foundation and dedicated to take up your cross and follow Christ who Glorified God! Join us by registering a scripture in the Bible. After you’ve completed your Preach1 Registration you will be able to start your 2 step process for your documented Mansion, please click on my document below after your registration signup for publishing. 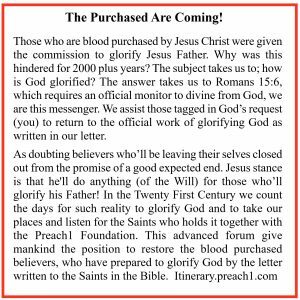 The mystery discovery belongs to the Preach1 Foundation. 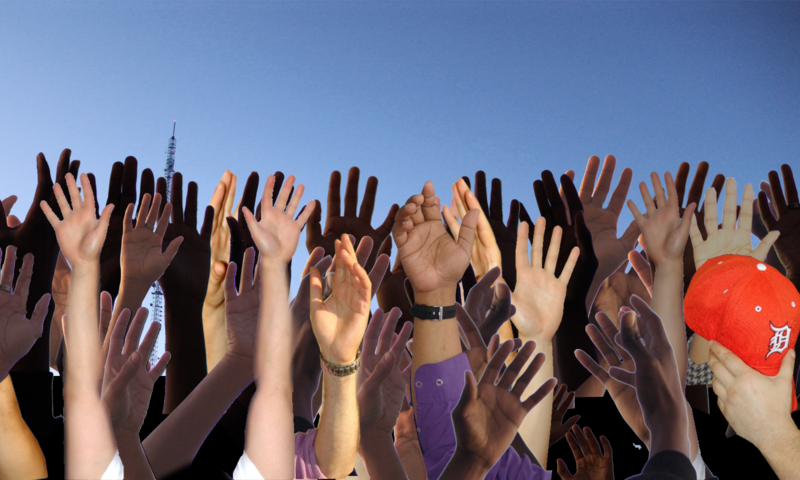 We are the entity to deliver the people to the greater works requested of Jesus Christ. This greater work is to glorify God by His Word. We back up our assignment with scripture reading at Romans 15:5-6, for such truth as related to purpose. We give honor for God’s Mercy to allow to follow through His total Word for duty as accepted by Saints (Saint; those believing our Lord). No man has glorified God since Jesus Christ fulfilled his Cup over 2000 years ago. The 21 century comes in with God’s selecting this man and divinely anointed ‘Larry Denson with His authority to grow His People in the Preach1 Foundation’ leading the nations to His UN-Forsaken Assembles where God is glorified by mankind. 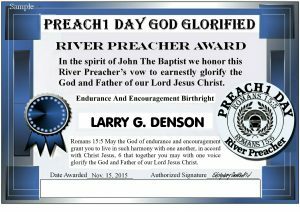 Larry Denson has became a living soul inside of Romans 15:6 for the duty of God’s Wishes to be glorified on a day called Preach1Day. Blessings to all who follows through Larry’s letters and his most a prized piece of paper: Preach1 itinerary. To glorify God; this has always been a wonder to Man. It was not until the 21st Century of Mankind, a way was made to glorify God in our present state of lost (distance from God) in the Earth. The generation of Man is given a first time to grasp the opportunity to glorify God by His written Word (Romans 15:6)! The Take-Away from this is to live in harmony with each other, a mind set to love thy neighbor as thy self. Just in the word ‘harmony’ alone, it has many pouts of ventures to enrich Man’s life. 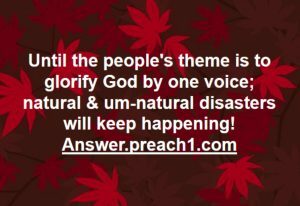 As believers in God we must now mount up the Men, Women, Toddlers and head to the um-forsaken assembly of reckoning, where Man’s voice meet God’s Ears in Heaven, glorifying God together, unanimously! The Bible never gives us an assured notice that God would ever be glorified by our generation of those in Christ Jesus, but leaves this ‘If’ statement at John 13:32 for a heads-up. Now that a certain release of power is expected from Romans 15:5, it shall also summons a timeline bringing a fearless opponent to our landmark(s). 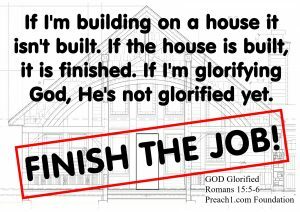 If the people move in slothfulness, not reaching their neighbors to pledge by God’s expressed works in Romans 15:6, which assures He’ll be glorified from Earth or Man will meet the opponent (God’s Enemy) face to face! We’re showing our dynamics of Romans 15:6 for its duties and expression to bring the Saints to unveiled (outside) for a victory from God to Man. This scripture calls to neighbors of their landmark. 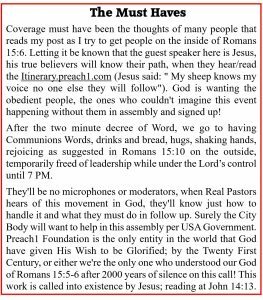 Noting that one or a few people can’t complete the prophecy of Romans 15:6 because ‘ one voice’ is every Word God has given in inspired writings to mankind. 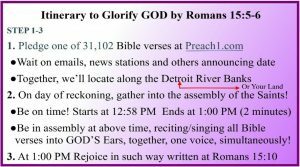 Hence, to complete Romans 15:6 God is requesting a minimal of 31102 people; because that’s how many verses there are in His Word (the Bible) to glorify Him. With that being said, its time for the Saints to come together and recite/sing all God’s Word into Heaven. I hope you’re not lost in the prophecy of Romans 15:6. If not, receive your key to take your landmark across the bridge at Romans 15:6 with us. 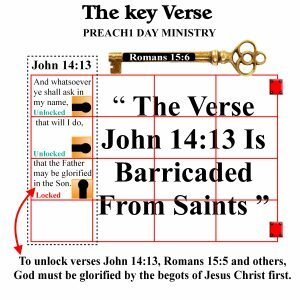 The question for you today is; can you assist the Saints in mounting up as assigned in the itinerary below and completing the destination clear through to the other side of Romans 15:6, for such a victory that’s been laying and awaiting us for thousands of years at Romans 15:5, in a two minutes assembly for God. Officiating by Larry Denson, God’s Messenger. Its time you make an informed decision, are you going to live in the grant from God of Endurance and Encouragement or stay within the margins of assignment given in your measure of faith without a spiritual breakthrough?